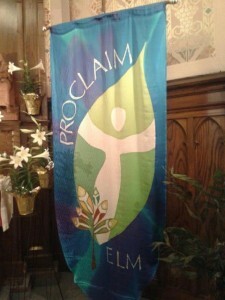 ELM and Proclaim come to life through your encouragement and support. Learn how you can support LGBTQ leaders and allied ministries. The Fall-Winter MISSION Newsletter is now online. You may have received a copy in your mailbox a few weeks ago. Now’s your chance to tell your friends about the work of Extraordinary Lutheran Ministries and why you support it! Freed and compelled by the Gospel of Jesus Christ to proclaim God’s love and seek justice for all, Extraordinary Lutheran Ministries envisions a church where all may serve God according to their callings. Extraordinary Lutheran Ministries affirms and supports LGBTQ Lutheran rostered leaders and those pursuing a call to rostered leadership while engaging allied congregations and ministries to proclaim God’s love and seek justice for all. This entry was posted on Wednesday, December 4th, 2013 at 10:12 am	and is filed under Blog. You can follow any responses to this entry through the RSS 2.0 feed. Both comments and pings are currently closed.